Whether you're remodeling or designing a brand new home, your window frames are an important part of your home's energy efficiency and overall curb appeal. There's nothing quite like wooden window frames to give your home a warm and elegant look. A wooden window frame was once the standard choice for a window. Wood is a naturally strong insulator, and it also gives your home a uniquely classic, often rustic, look. Read on for more information about wooden window frames. 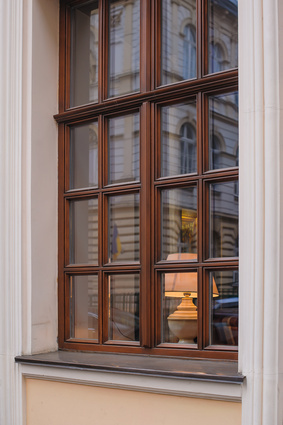 Despite the long tradition of wooden window frames, they require much more maintenance than vinyl, aluminum, composite, or fiberglass window frames. As a result, today many homeowners are choosing different materials for their windows. That said, if your heart is set on the naturally beautiful wooden window frame, never fear. Today there are a few different options for improving your wooden window frame's durability and energy efficiency. Some window manufacturers offer window frames with a wooden interior and a fiberglass exterior, offering the natural beauty of wood alongside fiberglass's durability. Other options to improve the durability of your wooden window frame include vinyl or aluminum-clad frames. These frames feature a wooden interior with a vinyl or aluminum exterior. This option provides a low-maintenance, more durable window frame for your home's exterior alongside the warm look of wood for your home's interior. How Much Will Your Wooden Window Frame Cost? A wooden window frame is more expensive than vinyl or aluminum, though less expensive than fiberglass. The cost of your wooden window frame will also vary, depending on the window manufacturer and whether or not you've chosen a fiberglass, vinyl, or aluminum exterior. A double-hung wooden window frame will cost about $550 to $750 per window. A small casement wooden window frame will cost about $650 to $850. Wood is extremely prone to warping, cracking, and rot from changes in temperature and humidity. Because of this, wooden window frames require regular maintenance. Homeowners should examine their wooden window frames once a month for signs of warping and rot. It's also important to regularly apply a sealer or preservative to the wood, every 12 to 18 months. Homeowners can remedy signs of rot by wiping the frame's surface with fine steel wool and mineral turpentine. It may also be necessary to remove severe rot with a chisel and fill the area with a wood putty. For small cracks, homeowners can lightly sand the area before applying a sealer or preservative. With proper maintenance like this, a wooden window frame can last for decades. Wood is a natural insulator, so a wooden window frame generally has a strong thermal performance and will keep your home snug. A wooden window frame with a fiberglass exterior will provide even more energy efficiency. Again, keep in mind that it's important to properly maintain your window in order to ensure that it provides you with an efficient, airtight seal. Although wooden window frames require more work than their vinyl, aluminum, or fiberglass counterparts, they are a beautiful addition. Additionally, you can choose a different material for your wooden frame's exterior to improve its durability. For more information about choosing window frames for your home, it's best to consult with a quality contractor.